Anomalous lanugo coat in a sub-Antarctic fur seal (Arctocephalus tropicalis) pup (photographed next to a normal black pup) born at Cape Davis Sealers Beach on Marion Island during the austral summer of 2015/2016. Latest publication from MIMMP. This opportunistic study identified for the first time uncharacteristic lanugo coat colourations in sub-Antarctic fur seal (Arctocephalus tropicalis) pups born on Marion Island. Instead of having normal black fur, a number of sub-Antarctic fur seal pups with lightly tanned fur coats were observed and recorded on the island between 2008-2018. Click here to access this paper! Nico de Bruyn, Principal Investigator of the MIMMP, has been involved in an exciting paper that has just been published online in the journal Trends in Ecology and Evolution. The review lead by Graeme Hays, Deakin University (Australia), and with contributions from a group of international colleagues evaluates how well marine animal tracking data has been translated into policy and conservation. There have been efforts around the globe to track individuals of many marine species and assess their movements and distribution, with the putative goal of supporting their conservation and management. Determining whether, and how, tracking data have been successfully applied to address real-world conservation issues is, however, difficult. Here, the authors compile a broad range of case studies from diverse marine taxa to show how tracking data have helped inform conservation policy and management, including reductions in fisheries bycatch and vessel strikes, and the design and administration of marine protected areas and important habitats. Using these examples, we highlight pathways through which the past and future investment in collecting animal tracking data might be better used to achieve tangible conservation benefits. Click here to access the paper! Currently, Marthán Bester is participating in the UK Overseas Territories ‘Blue Belt’ programme at the Tristan da Cunha Islands (TdC) (http://www.tristandc.com/wildlife/bluebelt.php) with the blessing of the TdC Government. The top predator (especially Subantarctic fur seal) research that is envisaged will feed comparative information into MIMMP. To this end he travelled to the UK on 04 March, visited our colleagues at British Antarctic Survey (BAS) in Cambridge for a day, and slotted in with the BAS arrangements to get their, and other personnel from CEFAS and RSPB, to the Falkland Islands by RAF airbridge. This entailed a 15 hour (5 + 10) flight from the Royal Airforce Base at Brize Norton, using a seated Airtanker A330 (with a brief re-fuelling stop at the Cape Verde Islands), to Mount Pleasant RAF airfield outside of Port Stanley, East Falkland Islands. After a very pleasant four days in Port Stanley, they boarded the RRS Discovery, an oceanographic research vessel, on 11 March, due to sail for the Tristan da Cunha Islands today, 12 March. After 9 days of sailing to the TdC, Marthán and three others will be landed on the main island of TdC for their particular purposes. The ship then goes off on a 10-day oceanographic survey of the seamounts around Gough Island to the south, before returning to TdC. On TdC Marthán will be assisted in the field (Seal Bay) by the TdC Conservation Department, deploying satellite-linked dataloggers on lactating fur seal females, and servicing our automated fur seal attendance pattern logging system that was put up in September 2018. After 10 days of surveying, the 4 pax and some passengers will be retrieved from TdC, and the expedition ends in James Town, St Helena some days later. Marthán will be returning to South Africa soon after. Watch this space for a narrative about the unfolding of this expedition! Kyle Lloyd (MIMMP PhD student) has started his 3 month visit to Montana State University (MSU) in Bozeman, USA. Kyle will be collaborating with Prof. Jay Rotella and colleagues of the Ecology Department to further his research on the population ecology of male southern elephant seals. The topics of his research will focus on environmental drives of pre-breeder vital rates and factors influencing senescence patterns in breeders. Kyle hopes to develop his skills in population modelling and to strengthen the MIMMP's budding relationship with MSU. Despite being cold and snowy at the moment, Bozeman offers a breathtaking environment to stimulate the Sealer's mind. A novel approach to dealing with complex capture-mark-recapture data has been published in the journal Ecology & Evolution, by MIMMP postdoc, Chris Oosthuizen, and colleagues. In life‐history analysis, the best solution to deal with unobservable states is to eliminate them altogether. In this paper, the authors achieve this objective by fitting novel multievent‐robust design models which combines robust design capture data collected during discrete breeding seasons with observations made at other times of the year. They use this approach to estimate breeding probabilities of female elephant seals. This flexible modeling approach can easily be adapted to suit sampling designs from numerous species which may be encountered during and outside of discrete breeding seasons. To read the full paper click here. Retired Emeritus Professor Marthan Bester, the initiator of the MIMMP and it’s Principal Investigator for three decades, will join the illustrious ranks of Fellowship of the Royal Society of South Africa during 2019. This fantastic accolade is bestowed for his lifetime of dedicated research and conservation efforts related to Subantarctic and Antarctic marine mammals, and particularly seals. Furthermore, his central role in the worlds largest successful island eradication of feral cats is regarded as a conservation success story the world over. His achievements are too numerous to recite, but importantly, he has achieved all this while being a generous mentor to hundreds of students, field personnel and colleagues. For more stories about the incredible legacy of the MIMMP and history of the cat eradication efforts, consider buying our popular legacy book “Pain forms the Character”. “This could be Scott’s hut”, I thought, as I stepped through the door and into the kitchen. Pine food boxes filled the wall to the left, and contained tinned butter, mold-speckled and rusted cans of fish, and gold-with-brown rust-encrusted paraffin food tins. It was dark inside, and damp as if in a cave, as wooden planks were hammered into the outside wall to cover and protect the single window from the elements. Were you able to look through that window, you would have seen the blue ice of the glacier beyond the small cove. Outside it was light, although shortly after 01:00 AM. It was going to be a long morning of shifting gear from the landing beach to the hut. But after the drama of the previous day we were euphoric to be here, even if it meant being deserted at midnight alone on this Antarctic island. Our journey here had started with delayed flights and two missed connections, and long airport hours. We arrived in Punta Arenas, Chile, on 23 November and 18 hours later stepped aboard “Achilles”, a frigate of the Chilean Navy. There were six of us: Team Harmony Point (Nelson Island) (Chris [South Africa], William [France] and Lucas [Brazil]) and Team Kopaitic (O’Higgens base) (Audun [Norway], Newi [South Africa] and Magdalena [Chile]. Andy [England/Australia] and Heidi [Finland] had already arrived at Deception Island, having left Ushuaia with a 5-star Hurtigruter tourist ship a few days earlier. Our board were of the 1-star variety one associates with army rations. Breakfast was sweet tea and a type of bread-roll, which also featured during afternoon tea. Lunch and dinner was a cooked meal consisting of (s)mash potato (often), rice or pasta, and some form of gravy, a small piece of meat, or a single vienna. Together, our three teams make up the predator tracking side of “krilltokt”, the Norwegian Polar Institute study to krill, krill-fisheries and ecosystem responses in the Bransfield Strait, West Antarctic Peninsula. Also on the Achilles were scientists from INACh (Instituto Antarctica Chileno) and quite a number of tourists. The tourists never ate with us, and I assume they had a different cook. We departed Punta Arenas 15:00 on 24 November and sailed south through the channels and fjords that lead to the open ocean. The hills and mountains that bound the narrow straits were covered by lush forest, and waterfalls drained the slopes. We passed the Darwin mountains – I am told – and several glaciers. It was a spectacular passage. We were exited to see that night, only to enter the waterways again and to sail in the Beagle Channel past Ushuaia to Puerto Williams, where we docked and went ashore for some hours. We were supposed to leave that night again, but were delayed by stormy weather in the Drake Passage…. We woke at 01:00 AM on 29 November and were ready to go to the island at 02:30 when the zodiac and barge were put to sea. We waved our goodbyes and off we went, like conquering Vikings, splashing into the waves, and speeding to the shore. The barge is called a SKUA, but looked a little like the boats used at Normandy during the Second World War. Fortunately, we had no enemy force shooting at us; instead, Pintado petrels swooped along with us and glided above and ahead without flapping a wing. The fog was thick over the island, which looked inhospitable and cold with snow covering most of the ground. We turned close to the shore and returned to the barge, to tell them where to land. They had engine trouble, with only one of the engines working. We circled them like a vulture waiting for an animal to die. Then we tried to push to barge to shore with our zodiac. We proceeded some distance, but finally the Armada – the Chilean navy – decided to abort the attempt. We were so close. Communication was difficult – Spanish and English. It took us some 30 minutes to get the barge back to the waiting ship. Our driver thought that the best way to turn the barge was to ram it. At one point we were nearly sunk by the barge as we carelessly drifted in front of it. We were back on the ship, somewhat shell-shocked that we had come so close to being landed but then our attempt was thwarted by an engine, not an uncontrollable variable like weather. The ship lifted anchor and immediately sailed for Fildes Station on King George Island. We successfully landed on the night of 30 November / 1 December, now nearly two weeks ago. We have settled in, and during a couple of good weather days deployed some 30 tags on penguins, and a camera. We are currently inhabiting the old Argentinean hut, but will set our tents as soon as we get a decent weather break that does not require immediate work. Though cold and run down (the hut’s door fell off the hinges earlier today, but we have repaired it (like biologists, not engineers)) it has been a great comfort during this first weeks. An image from a chinstrap penguin equipped with an underwater camera. This summer, MIMMP postdoctoral fellow Chris Oosthuizen is partaking in a multinational expedition in the West Antarctic Peninsula which aims to uncover predator-prey relationships that can be used in feedback management of the krill fishery in this region of the Southern Ocean. The invitation to participate in the expedition arises from the MIMMP’s current collaboration with Dr Andrew Lowther of the Norwegian Polar Institute (NPI) within the South African National Antarctic Programme (SANAP) framework. The Chilean Antarctic Institute (INACH) and Chilean navy support this cooperation by providing logistical support to the expedition. The large, multidisciplinary expedition in the Bransfield Strait spans most of the short Antarctic summer, from November 2018 to end February 2019. Using miniaturized telemetry devices, teams located on three different islands within the Bransfield Strait will study the foraging behavior of krill-dependent predators. Concurrently, the spatial distribution and abundance of the krill prey field will be obtained through ship-based acoustic monitoring. By combining predator foraging behaviour data and acoustic monitoring data, the spatio-temporal overlap between at-sea habitat use of penguins and fur seals and krill fishing effort can be estimated. The data on predator foraging behaviour collected during this (and past) field season(s) will assist in the development of spatially and temporally relevant feedback strategies for long-term management of the krill fishery, including the planning process for Marine Protected Areas (MPA’s). Chris (MIMMP, South Africa) will be based at Harmony Point on Nelson Island for the duration of the expedition, along with William Jouanneau (France) and Lucas Kruger (INACH, Chile). Nelson Island is part of the South Shetland Islands, and an Antarctic Specially Protected Area. Though most of Nelson Island is covered by glaciers, Harmony Point is ice-free and supports breeding colonies of 12 seabird species, among which one of the largest single colonies of chinstrap penguin (Pygoscelis antarctica) in Antarctica. Large giant petrel (Macronectes gianteus) and gentoo penguin (Pygoscelis papua) colonies also occur here. Seals do not breed here, but often haul out to rest. Harmony Point is botanically interesting too, as moss carpets, as well as lichens, fungi and two species of vascular plants, occur here. There is no field station Nelson Island and thus the team will camp for the duration of the expedition. South Africa is further represented on this expedition by Dr Azwianewi Makhado from the Department of Environmental Affairs (DEA), who was a MIMMP sealer on Marion Island in 1999/2000. Together with Audun Narvestad (NPI, Norway) and Magdalena Huerta (INACH, Chile), Dr Newi Makhado will be camping on Kopaitic Island near the Bernardo O’Higgens Base (Chile) on the Antarctic Peninsula. The final team, comprising Dr Andrew Lowther (NPI, Norway) and Dr Heidi Ahonen (NPI, Norway) set up camp at Deception Island on 23 November. The Harmony Point and Kopaitic Island teams sailed from Punta Arenas (Chile) on 24 November aboard the Frigate Achilles. They arrived at the South Shetland Islands on 29 November having navigated the Beagle Channel and Drake Passage on the way. “Stand out from the crowd” by Chris Oosthuizen. Overall winner of the 2018 BES photographic competition. MIMMP postdoc, Dr. Chris Oosthuizen, has been announced as the overall winner of the British Ecological Society Annual Photography Competition 2018, for his image “Stand out from the crowd”!! “Stinkpot special: Penguin a la King” by Chris Oosthuizen, winner of the Dynamic Ecosystems category within the BES 2018 photographic competition. As if that is not wonderful enough, he also topped the “Dynamic Ecosystems” category with a winning shot entitled “Stinkpot special: Penguin a la King”, showing a Giant petrel preying on a king penguin chick at Marion Island. For further interesting details behind these remarkable photos read this article. To view all winning images visit the British Ecological Society website. Evaluating how populations are connected by migration is important for understanding species resilience in changing environments. Gene flow can help recovery from demographic declines, sometimes quite dramatically as in the case of Antarctic fur seals (Arctocephalus gazella). In a study now published in Royal Society Open Science an international team (including the MIMMP) investigated the extent to which migration may have contributed to the global recovery of this circumpolar distributed marine mammal that was brought to the brink of extinction by the sealing industry in the eighteenth and nineteenth centuries. It is widely believed that animals emigrating from South Georgia, where a relict population escaped sealing, contributed to the re-establishment of formerly occupied breeding colonies across the geographical range of the species. To investigate this, we interrogated a genetic polymorphism (S291F) in the melanocortin 1 receptor gene, which is responsible for a cream-coloured phenotype that is relatively abundant at South Georgia and which appears to have recently spread to localities as far afield as Marion Island in the sub-Antarctic Indian Ocean. By sequencing a short region of this gene in 1492 pups from eight breeding colonies, we showed that S291F frequency rapidly declines with increasing geographical distance from South Georgia, consistent with locally restricted gene flow from South Georgia mainly to the South Shetland Islands and Bouvetøya. The S291F allele was not detected farther afield, suggesting that although emigrants from South Georgia may have been locally important, they are unlikely to have played a major role in the recovery of geographically more distant populations. Three field assistant positions (2 x "Sealers" and 1 x "Whaler") are once again available at Marion Island, April 2019 - May 2020. 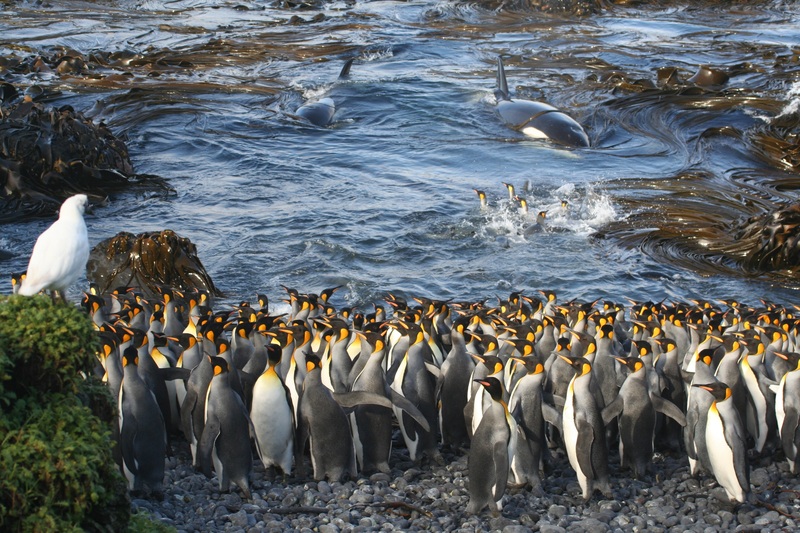 All three positions are embedded within the research programme: "Marion Island Marine Mammals: Individual Variation and Population Processes in Changing Environments", maintained through the University of Pretoria. APPLICATIONS MUST BE SUBMITTED VIA OUR ONLINE SYSTEM*(click on text to redirect). *Emailed submissions will not be accepted. An overview documentary of what you might expect in these positions can be viewed here and further insight about our science gained by listening to a public talk (here) or viewing our publications. Additional information about the positions and a background to the programme can be found on our programme history, 'working with us' and FAQ pages. If you missed the Science and Cocktails talk earlier this year and you would still like to hear Prof Nico de Bruyn's talk on seals and killers in the roaring forties, then please click on the link below! MIMMP postdoc Chris Oosthuizen in Svalbard, Arctic! The MIMMP has a long history of conducting research in the sub-Antarctic and Antarctic ecosystems; one of our flagship projects, the demographic study of Marion Island’s southern elephant seal population, is now continuing into its 35th consecutive year. But we are always interested in collaborating with other research teams. For example, Marion Island sealers were represented on all seven of the seal and seabird research expeditions undertaken by the Norwegian Polar Institute (NPI) at Bouvetøya between 1996/97 and 2017/18. We have less experience of working in the Arctic, but it is within the context of our Bouvetøya collaboration that Chris Oosthuizen (current Marion Island Marine Mammal Programme postdoctoral researcher) recently found himself in the Svalbard Archipelago. Svalbard is a large archipelago located in the Arctic Ocean north of continental Norway. At 78°N, Longyearbyen on the island Spitsbergen is the northernmost year-round settlement on Earth and only 1300 km from the North Pole. Chris was invited to participate in the Svalbard expedition by Dr Andrew Lowther of the Norwegian Polar Institute, with whom he has worked on Bouvetøya for two summer seasons. Dr Lowther is leading a project investigating the impacts of drones (Unmanned Aerial Vehicles) on marine mammals in terms of disturbance and the use of drones as alternate research platforms. This project aims to provide best practise guidelines regarding the appropriate use of drones around wildlife by developing flight profile standards that are 1) capable of delivering scientific goals and 2) create insignificant levels of disturbance when used in both scientific and a recreational setting. For the work conducted during May and June, the team camped near a harbour seal colony on Midtøya, a small island adjacent to Prins Karls Forland. This is the only harbour seal colony in Svalbard and the northernmost one in the world. Another Antarctic fur seal research output from our productive and ongoing collaboration with colleagues from Australia, the UK and USA. Here, Ben Arthur and co-authors put forward data on changing foraging patterns in the species from three Southern Ocean localities (including Marion Island) over several decades, and include some thoughts on management implications. A new study led by MIMMP postdoctoral fellow Chris Oosthuizen and published in the journal Oikos shows that size matters in more than one way for elephant seal pups. This paper used data collected over a 30-year period to determine the relationship between weaning mass and fitness in elephant seal pups from Marion Island. Pups were marked and weighed at weaning – a considerable task for the sealers in the field given that elephant seal pups weigh 114 kg on average and up to 190 kg at weaning – and then followed through their lives. Weaning mass correlated positively with first-year survival (Figure left), but its influence was unimportant for survival of older pre-breeders and breeders. In contrast, a strong positive link persisted between weaning mass and the age of first reproduction, which typically occurs at ages three and four in female elephant seals (Figure right). Heavier female elephant seal pups survived better in early life and started breeding at a younger age than lighter-weaned pups. The importance of weaning mass on early survival has been reported previously, but this paper draws particular attention to the previously unknown influence of weaning mass on the age at first reproduction. This is a noteworthy finding considering that recruitment only occurs several years after weaning, and because pre-recruitment mortality already imposed a strong selective filter on the population. Reproductive parameters such as age of first reproduction typically impact fitness less than survival in long-lived species, but still influences the dynamics of populations through ensuing effects on other traits (e.g., tradeoffs between reproduction and survival). In growing populations, however, early reproduction increases fitness, indicating the importance of taking the timing of reproduction within the life cycle of an organism into account. Although variation in weaning mass did not translate to permanent survival differences among individuals in adulthood, it explained heterogeneity and positive covariation between survival and breeding in early life, which contribute to between-individual variation in fitness. Mothers that do not allocate sufficient energy to their pups thus risk reducing their own fitness through lower offspring survival and delayed breeding among surviving offspring. Join us at The Orbit in Braamfontein on the 27th of February to listen to Prof Nico de Bruyn talk about seals and killers in the roaring forties. In this talk, Nico de Bruyn will give us a whirl-wind tour of the research that has driven three decades of scientific inquiry into the population dynamics of mammalian marine top-predators and explain how this research has helped to answer questions of global significance from a region experiencing increased environmental change. This talk is hosted Science & Cocktails which is an initiative that brings science and entertainment closer together by creating a series of public lectures intertwined with music/art performances and smoky dry-ice chilled cocktails in your hand. Tucker et al. (2018) Moving in the Anthropocene: Global reductions in terrestrial mammalian movements. Science 359: 466-469. Sometimes a collaboration that started on one topic can turn into something productive on a somewhat different one! A paper published today in the journal Science, on which MIMMP PI, Nico de Bruyn, is a coauthor represents such a case. This paper, led by Marlee Tucker, uses tracking data from multiple terrestrial mammals to show that humans are causing major changes in the way wild mammals move in the landscape. Fig 1 taken from Reisinger et al (2017) Diversity and Distributions, showing the tracks of 14 species of marine vertebrate predator over a decade. The distribution of marine predators is driven by the distribution and abundance of their prey; areas preferred by multiple marine predator species should therefore indicate areas of ecological significance. Research collaborator (and past student) of the MIMMP, Dr Ryan Reisinger along with a multinational research team used tracking data from 538 tag deployments on 14 species of marine predators from the Subantarctic Prince Edward islands to identify important habitat. Tracks were modelled as a response to 17 relevant environmental factors to identify such important habitat. The study, recently published in the journal Diversity and Distributions , helps to form the basis of future efforts to predict the consequences of environmental change. Tracking locations covered 39.75 million km2, up to 7,813 km from the Prince Edward Islands. Areas of high importance were located broadly from the Subtropical Zone to the Polar Frontal Zone in summer and from the Subantarctic to Antarctic Zones in winter. Such areas of importance were best predicted by factors including wind speed, sea surface temperature, water depth and ocean current speed. Prof Nico de Bruyn-category winner in a prestigious photographic competition! Scientists from across the world were asked to submit their photographs for the 2017 Royal Society Publishing Photography Competition. The MIMMP's Principal Investigator, Prof Nico de Bruyn, was awarded the winner of the "Ecology and Environmental Science" category. The MIMMP team would like to congratulate Professor de Bruyn on this prestigious award! Please see the link below for the winning picture. Three field assistant positions (2 x "Sealers" and 1 x "Whaler") are once again available at Marion Island, April 2018 - May 2019. All three positions are embedded within the research programme: "Marion Island Marine Mammals: Individual Variation and Population Processes in Changing Environments"
Please read the advertisements carefully and follow the application instructions therein. Inquiries and cover letters may be sent to Ms Kate du Toit (katedutoit@hotmail.com) and cc to the Principal Investigator of this specific project: Prof Nico de Bruyn (pjndebruyn@zoology.up.ac.za).